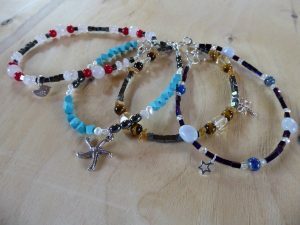 Finally, I’ve found the time to put my handmade gemstone anklets onto my website! Please tap on the image for the link to the whole selection of anklets. I can make them to order in any length if the size isn’t right for you. They will also soon be in my Facebook shop which links to my website anyway. Please message me anyway you like if you want one. Prices include a small amount for secure postage. This lovely hot weather is gorgeous, but it makes it very difficult to work and the last thing I could cope with was sitting over a hot computer! So we have a slightly cloudy day here (Nr Tring) with a cool breeze and I made myself sit here for the day. At least I’m not my poor cat who is flopped around in the coolest parts of the boat. Temperatures inside the boat have been around 30-28C even in the evening. Phew! We can’t shower all the time either like you lucky people in your houses. I heard on the news that the average person is using 145ltrs of water a day. Well at that rate, our water tank would be empty in 2 days for the two of us!